Do you want to start a video blog? You have a few ideas about what to say and you are pumped full of enthusiasm. Wo there nelly, steady on. You don’t want to rush head long into such a big commitment without thinking it through. Starting in a rush will only lead to your vlog crashing and burning in spectacular fashion. Let me help you get started. I’ve got you covered from purpose to promotion and all that lies in-between. 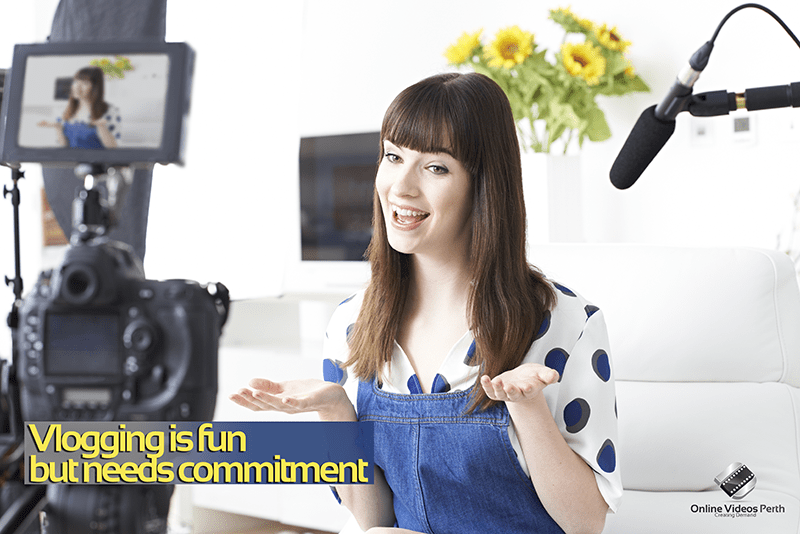 Why Do You Want to Start a Video Blog? This is a question you really must ask yourself before you hit the red record button. What is my purpose? Why am I going to all this effort? If the answer just rolls off the tongue, we are on solid footing. What demographic will watch your video blog? Who will you be talking to? Will your content relate to a particular niche? These are vital questions you need answered if you want to build your audience. Start with the end game in mind will always ensure some sort of success as this will allow you to plan and work towards those goals. Great stuff, now you know your purpose, niche and audience, now you have to answer a few questions that will help you gauge your commitment to video blogging. Do You like learning more? You may know all that there is to know about your niche, but to stay current, you must keep on top of the latest news, trends and developments within your industry. Do You like filming and editing? Filming and editing is a huge part of being a video blogger, so if this is something that doesn’t interest you or scares you, then reconsider your decision. Do you like being on social media? To be able to promote your video blog effectively, you must be comfortable being on quite a few social media platforms. Posting behind the scenes photos on Instagram, asking questions via a poll on Facebook or hosting a Google HangOut with your viewers all mean a large amount of exposure on social media. Planning, planning, planning is vital to your success. Plan different threads of conversation, your publishing schedule, when to post what, collaborations, marketing and promotions all need planning, so you better get used to it. Do you like the idea of getting involved with your viewers? Like any success, it depends on relationships and your relationship with your viewers is vital. Get to know them, ask them questions and for their opinions are the ways that your audience can relate to you. So you have passed Boot Camp and you are ready to take that big step to film your first video blog, what do you use? Lets start with the obvious, the camera, your video blog won’t exist without one. Thanks to digital technology, must of us will have a suitable camera somewhere close. It may be your mobile phone or it may be the handy cam you bought to take on holidays. The minimum quality you need is HD (this is the size of the image and the number of pixels) Most new cameras will film in Full HD which is 1920×1080, but 1280×720 is the minimum HD quality needed. Remember with smart devices, people are watching YouTube on their big screens at home, so any video that isn’t HD will look very grainy and your audience will soon switch off. To compliment your camera a good tripod is essential for nice, steady pictures. These are easy to come by, you can get desk top mounted ones for under $10 all the way up to one phase, carbon fibre which can got thousands. If you are using your smart device you can get a mount that will attach to your tripod, but generally a decent tripod should cost you less than $100. Good audio is probably even more important that good pictures because the viewers tolerance for bad audio is a lot lower than bad pictures. buying a mic depends on which camera you are using. Generally you are looking at two types of mic, a directional or a lapel. A directional mic usually sits on the camera and is a cylinder shape which points directly at the person talking. This mic only picks up sound within a certain range and distance, which means it doesn’t pick up extraneous noise very well. A lapel mic sits on the breast bone/chest area of the person talking and only picks up sound with in a very short range. Rode are a great brand to buy as they have a great range of mics for all sorts of cameras and smart devices, plus they aren’t that expensive. Lighting can be the difference between a ok video and a great video, but it can be the trickiest to master. I always recommend using as much natural light as possible to start with and when you are confident, then move onto artificial light. Film facing a nice open window that lets in nice amount of light, that way the light is even and gives off a good skin tone. The next stage is YouTube, there is no way I could cover everything about YouTube in this article, but I will cover the basics to get you started. First, create your channel, this means giving it a name and like any marketing, a name is important. It must connect with your audience and give you some sort of identity. Creating a logo and Channel Art is the first step in branding your video blog. This will help immensely with recognition and awareness when promoting across your different social media platforms. Plus it also helps when you get to merchandising. Branding all your video blog posts is important. Now that can be incidental (in the background, or on a piece of clothing etc.) or up front with banners, watermarks and on screen graphics. YouTube also gives you opportunities to brand your videos with clickable watermarks. An important part of having a success video blog is getting involved with your viewers comments. This is vital to building a community or tribe around your content. If your viewers think you are in it just for the money or the fame then they will drop you like a hot potato. Be authentic, ask for comments and opinions and be a part of that conversation. Now that you are involved with the on going conversation around your content, don’t forget your shout outs and mentions. This is an effective way of bringing your viewers and subscribers into your videos. People love getting a mention in a video, especially if it is by someone they like and admire. This will encourage them to watch and even to tell their friends to watch to see/hear their shout out or mention. Awesome, you have produced a few posts for your new video blog, but now what. The internet isn’t like that Kevin Costner film “Field of Dreams” – “If you build it they will come” If only! No, you have to promote that video to within an inch of it’s life if you are going to get people to watch it. Here are a list of ways you can promote your videos. Test custom thumbnails – some thumbnails encourage clicks, while others, not so much. Collaborate with other YouTubers to leverage off their audience. Start a blog about your content. Guest write on other blogs. Add a subscribe widget to your website, YouTube channel etc. Participate in forums that cover your niche. Post your publishing schedule and stick to it. Reward subscribers that share your content. Make use of contests and giveaways. Embed and share playlists fro increased views. Don’t forget your call to action at the end of every video. So there you go, we have covered just about all the bases to get you started with your video blog. We have asked the hard questions to ensure you are clear on your niche, goals and what is expected of you. We have covered which equipment you need to get great sound and pictures and given you some guidance on creating your YouTube channel. In the spirit of giving I would like to leave you with a few tips to make your blog as awesome as it can be. Look directly into the lens, remember you are talking to someone. Film extra footage as it always comes in handy whether for time lapse or behind the scenes etc. Mistakes are ok, a little stumble or pause here or there is fine, remember, be authentic. Use YouTube’s APIs to get YouTube badges. Allow others to embed your videos, after all they are sharing your content. If you are interested in video blogging and want to start off small, you can download my free eBook that is floating around this website. It has hints and tips geared towards mobiles and smart devices and will definitely get you started. If something more professionally set up, that you can operate yourself, or you would like professional help and encouragement, please feel free to contact Reg, obligation free on 0401 719 859 for a free chat about your idea.